I grew up in the prairies where you might argue that there is not much landscape. But that is not how I saw it. As a child I roamed over the tiny little hills and broad flat plains and noticed all kinds of fine detail. It wasn’t until I was at university, though, and by chance took a geology class, that I realized how all of these details fit together to tell a very dramatic story about deep earth forces, great glaciers, roaring waters and howling winds that worked together to create the landscape that I knew. There are things about our landscapes that we know well. We know where the best sledding hills are and how to bike from point A to point B without having to pedal up the steepest roads. We know which parts of the river have the biggest fish, and we can tell what the weather will be like by where the clouds are with respect to the mountains. The purpose of this module is to gain the tools and vocabulary necessary to observe and describe our landscape in more detail, and to use these tools to make inferences about the processes that created it. This module assumes some prior knowledge of the theory of plate tectonics and the rock cycle. For a review of these concepts, visit This Dynamic Earth: The Story of Plate Tectonics Online Edition from the United States Geological Survey, and have a look at this interactive rock cycle animation from the Exploring Earth website. 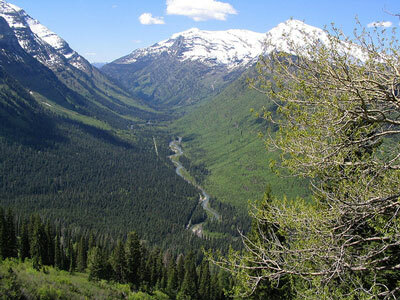 Figure 3.1: This U-shaped river valley, near Glacier Park, shows features typical of many Montana landscapes. Look closely at the typical Montana landscape shown in Figure 3.1. The stream running through the valley is a clue: obviously running water is a force that can carve valleys out of solid rock over time. Look again at the shape of the valley. It is not a steep V. Instead, the valley has a U shape, an important geologic characteristic. Check Your Thinking: Can you describe processes that worked to form the valley show in Figure 3.1? Now have a look at the shape of the valley outside your window and think about what kinds of forces might have been at work to form it.